An international union delegation including Atra Narwanto and Lutfi Arifiyanto, the victimized leaders of independent unions at Coca-Cola Amatil Indonesia, is currently meeting with IUF affiliates representing Coca-Cola workers in Canada. The delegation is travelling on behalf of affiliates struggling to access their rights at Coca-Cola in the Philippines, Indonesia, Haiti, Ireland and Spain, spreading the word about The Coca-Cola company's serial human rights violations. 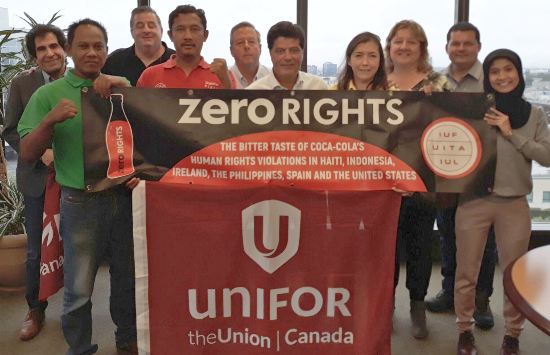 The solidarity tour of Canada follows on international IUF protests in Atlanta and meetings of an international delegation with unions at Coca-Cola in the USA.